1997’s ‘The Fifth Element’ had it all; alien opera, robotic turkeys, Milla Jovovich, a malevolent cosmic entity, and – of course – flying yellow cabs. This is Bruce Willis’ hover taxi and it comes from Davdup of Flickr who has done a superb job of recreating it in Model Team form. There may not be a super-hot-saviour-of-the-universe in the back seat, but it’s got everything else. Click the link above to hail a ride 250 years in the future. This TLCB writer was not impressed by the Ford Crown Victoria taxi he experienced in New York. Bumpy, not actually that big inside, and probably getting around 8mpg, it seemed a bizarre choice for the congested and awful roads of NYC. More recently most New York cabs are Toyota hybrids, which seem a far more sensible choice, but we’d still pick this over both the Crown Vic and an anonymous modern appliance. Based on no one particular classic cab but taking design cues from all of them, Flickr’s Redfern1950s has created a stunning looking ’50s taxi complete with suicide doors, bench seating, and a huge trunk for some old-timey suitcases. Stick your hand out and hope this picks you up rather than a ratty old Crown Vic via the link above. The single most received message we get here at The Lego Car Blog (besides texts from your Mom of course) is ‘Can I have instructions for [insert model here]?’. Normally the answer is no, but today we can answer with a yes. And then some. Because not only has Flickr’s de-marco made instructions available for his lovely 5-wide classic taxi and pick-up truck, he’s even written a parts list and made a video for each model showing the building steps! Head over to de-marco’s photostream via the links above and fill your boots! The Lego Car Blog staff might all have clothes slightly too small for them after Christmas but the Elves, locked up over the festive period, are hungry. Imagine the delight of the first Elf back then, when it was awarded not one but four meal tokens. Will it spread its four meals out, or binge on four dinners in one go? I think we all know the answer to that. The cause of this Elven gluttony is Vibor Cavor (aka Veeborg) who has built four beautiful versions of the mid-1940s Chevrolet Fleetmaster. Clockwise from top left is a police fastback, a taxi sedan, a fire chief coupe, and a delivery-bodied ambulance conversion. Each model is wonderfully detailed inside and out, includes opening doors, hood and trunk/tailgate, and features hand-of-God steering. There’s more to see of all four Fleetmasters at both Vibor’s Flickr photostream and MOCpage – click the link to check them out. At least, that’s what your Mom told this TLCB writer. It’s a philosophy adopted by Flickr’s LEGO 7 too, who has constructed this charming micro-scale scene in which none of the vehicles are more than two studs in width. They’re all instantly identifiable though, with a taxi, police car, excavator, cement truck, ambulance, semi truck, coupe and bus all recreated brilliantly in miniature and placed within a clever modular roadway. There’s lots more to see of all the vehicles plus the neatly designed base at LEGO 7’s photostream – click the link above to check it out. Apparently this futuristic artic tractor unit is a taxi. Whatever its function, it’s well worth visiting its creator’s Flickr Photostream to see more details and play features. The builder goes by the name of Gray Mini, though we can’t spot that particular vehicle amongst his models. One of the greatest movies of all time – Martin Scorsese’s 1976 ‘Taxi Driver’ – created two very different but equally brilliant stars in Robert De Niro and a very young Jodie Foster. There was another star of course; the bright yellow Checker Marathon cab driven by De Niro’s Travis Bickle. Already world famous, the Checker didn’t need the movie to earn its notoriety, but it did probably become much cooler as a result. This perfect replica of the iconic classic cab comes from TLCB regular Ralph Savelsberg aka Mad Physicist, and you can see more here. …has crummy taxis. The Ford Crown Victoria is big on the outside yet small in the back, inefficient, uneconomical and hugely polluting. None of things you want from a vehicle that spends its time threading through congested city streets with a paying customer in the rear seat. Still, the Crown Vic is designed to run for ever and thus it became the default choice for cabbies and police departments across America back when gas was cheaper than water. 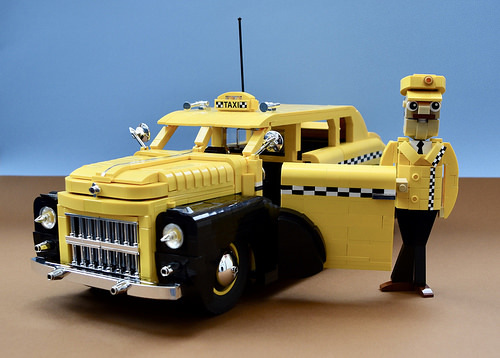 This stunningly accurate replica of the iconic Crown Vic in New York City Taxi livery has been built by Flickr builder and TLCB regular Ralph Savelsberg aka Mad Physicist, and it’s as good as anything you’ll see in a Legoland theme park. You can hail it for yourself at Ralph’s photostream via the link above. South Africans love their Toyotas. Reliability is everything in such a vast, dangerous and empty landscape. However this particular Toyota is feared and loathed by anyone not at the wheel. It is of course the Hiace, and it’s the favoured tool of South Africa’s criminally-run minibus taxi companies, who – much like the drug cartels of South America – are at war over territory, regularly killing one another in order to expand or protect their business interests. Ageing, dangerously maintained, and wildly overloaded Hiaces make up the majority of the taxi fleets, and almost all are driven with a suicidal abandon that ensures the road ahead of them is quickly cleared. This 1979 example typical of South Africa’s most dangerous vehicle comes from Flickr builder and regular bloggee Senator Chinchilla, and you can see more (from a safe distance) at his photostream – click the link to make the jump. With less than a week to go it’s getting tight at the top of TLCB Summer Building Competition. This entry comes from MOCpages’ Markus Schlegel who’s making his TLCB debut. The Elves usually don’t like taxis. They tend to be slow and old looking (London), or spectacularly dull (everywhere else). Plus we don’t like using them with the Elves in tow as we’ll inevitably have to pay the additional ‘soiling charge’. A charge that’s far more likely to required with this; Markus’ racing London Taxi FX4. Markus has put a big tick in both the ‘fast’ and ‘stripes’ boxes with his brilliant competition entry, plus his taxi features working steering, opening doors, bonnet and boot, and folding jump seats. There’ll be a standard version posted soon too, and it could be one of the most realistic models of the year. In the meantime you can see more of the version TLCB Elves prefer by clicking the link to Markus’ MOCpage above, and you can find out more about TLCB Sumer Building Competition entry requirements and the awesome prizes available by clicking here. 1997’s blockbuster The Fifth Element contained everything you could possibly want in a sci-fi movie; Flying cabs, Milla Jovovich, giant robotic turkeys, Milla Jovovich, exploding spaceships and Milla Jovovich. TLCB regular and Brothers Brickist Ralph Savelsberg (aka Mad Physicist) has applied his talented hands to the first item on the aforementioned list (insert your own joke about the second, fourth and sixth), with his brilliant Lego recreation of Bruce Willis’ hover cab. Ralph has also constructed a brick-built Milla Jovovich, but for some reason it doesn’t quite capture the subject matter in the same way. Anyway, while we make friends with Google Images you can see more of Bruce’s taxi (and Milla) by visiting Ralph’s Flickr page here. One of The Lego Car Blog’s very favourite builders has taken the brave – and often envied – step into the world of professional Lego model making. Certified LEGO Professionals Bright Bricks can now count the ridiculously talented Nick Barrett amongst their building staff. Nick joined the Bright Bricks team bringing a wealth of vehicular knowledge, which they’ve put to excellent use in their latest commissioned project, ‘Bricks in Motion’. Bricks in Motion is taking place at the Milestones Museum in Hampshire, UK until the end of April 2015, featuring many creations by Nick, as well as few other builders including regular bloggee Ralph Savelsberg. 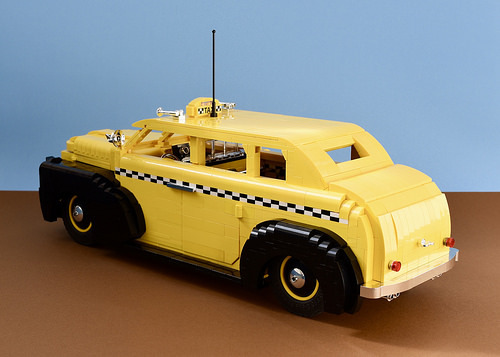 …as well as themed creations from around the world, like these brilliant Lego taxis. There are also a few nods to some of the most important vehicles of history, including famous ships and trains, such as the widely recognised pioneer of steam travel, Stephenson’s Rocket. There’s lots more to see at Nick’s MOCpages account and you can see what’s on at the Bricks in Motion exhibition – including their children’s building activities and Mindstorms robotic workshops – via the link in the text above. If you think that becoming a professional Lego model maker might be for you, then you can read our interviews with some of those who have gone pro by clicking this link to our Interviews page. Previous bloggee Aitor Fernandez is making another appearance here with another excellent Town scale car. 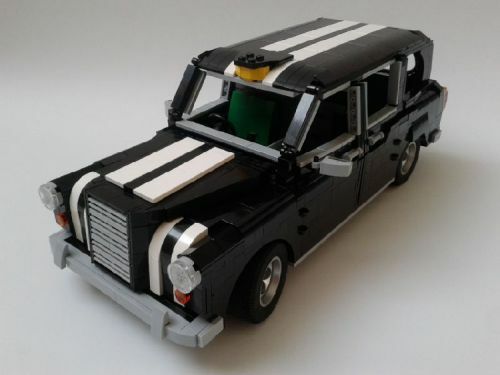 This one’s a classic Checker Cab and you can see more on MOCpages. Plus points if you can identify the set that the trunk-lid sticker came from! Anyway, as we prepare for the appearance of a perfectly spherical – and possibly quite ill – Elf, you can check out its finds by heading to Aitor Fernandez‘ MOCpage. There’s an ’80s Ford Crown Victoria taxi, a beautiful Rolls Royce Phantom, and a neat ’65 Pontiac Firebird – all of which can be viewed via the link above.